InterConnect offers an array of Portals that allow access to SAP Business One for different user audiences. Each Portal has its own website, but uses common infrastructure to connect to a specific SAP Business One company database. Details of infrastructure requirements and software prerequisites are outlined below. For a detailed outline of possible configurations, see Infrastructure Architecture. The configurations below describe the most common server arrangement. 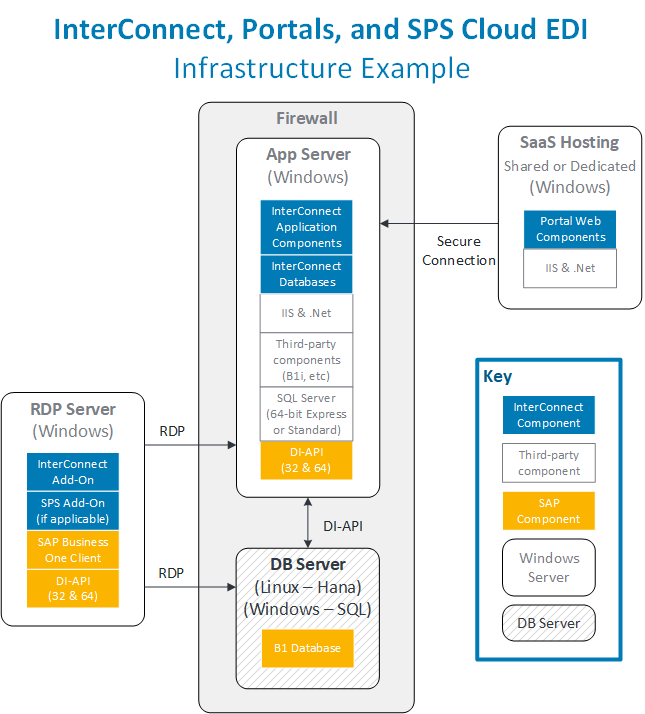 Detailed examples for SQL and Hana are shown in Infrastructure Architecture. Identify the web server where the Portal website(s) will be installed. Identify the SAP Business One server and Application server where B1WebAPI and InterConnect Server Tools will be installed. Tip: Use separate web and application servers. This will avoid performance and security issues that can occur when running a successful Portal website on the same server as a busy ERP system. Ensure Typical Hardware and Software Requirements are met. Ensure full administrative rights are assigned to the user who will be installing the software. Create a back-up of all SAP Business One databases prior to installing new products. Carefully review this Implementation Guide prior to performing the installation and basic configuration. Download the latest version of the Portal package. Below are the minimum requirements. Consider improved hardware if high volumes of web traffic or large numbers of B1 users are involved. 4 GB RAM or higher. 2GHz Dual Core processor or better. 100 GB hard drive or higher. 100 Mb Network or better. Windows Server (32-bit or 64-bit) Enterprise, Standard or Web Edition. See Release Notes for supported versions. Ensure all stable security patches have been applied. .Net Framework 4.5 (or higher). The web server must have access to the B1WebAPI instance. Speak with your SAP Business One consultant to confirm these details also cover other third-party application requirements. 4-8 GB RAM or higher. Windows Server Datacenter, Enterprise, Standard or Web Edition. See Release Notes for supported versions. Ensure all stable security patches have been applied. Microsoft SQL Server. See Release Notes for supported versions. Hana Only: 64-bit Express Edition or 64-bit Standard/Enterprise Edition. ODBC Hana drivers installed (Hana Only). Network usage minimums are below. Consider improved bandwidth if high volumes of web traffic are involved. Speak with your SAP Business One consultant. Tip: To set up secure access to your B1WebAPI, you can set up a secure firewall tunnel that allows the web server to access the B1WebAPI without exposing the B1WebAPI to the general internet. Common configurations are summarized below. Refer to details above for specific versions. https://productdocs.vision33.com/downloads/ contains the latest download packages. To download installation files, a username and password are required. Contact support (support@vision33.com) for access. The latest version of the Portal installation package is displayed in the top section and is labelled Portal installation files for the appropriate version of SAP Business One. To download the installation files, click on the link and enter the username/password information when prompted. Tip: Extract the installation files to a flash drive or a mapped network drive for easy access from both the web and SAP Business One servers. Note: Best practice is to upgrade all Portals at once. Listed below are the components required for each standalone Portal, so if you have multiple Portal products, inspect each Portal's upgrade notes before proceeding. The following upgrade chart shows which components need to be upgraded between versions. All components for versions prior to Service Pack 4 for B1 9.1 (version 91.4) require upgrade. Not every version requires an upgrade of B1WebAPI. Review the upgrade chart above to determine if this is required for your upgrade. Before upgrading B1WebAPI, make a backup of any customizations. Also, make a backup of the configuration file, typically C:/Program Files (x86)/zedIT/zed B1WebAPI/bin/b1enabler.config. To safely back up these files, save them into another folder (such as C:/backups/) so they are not deleted or overwritten by the installer during the upgrade. Confirm data migration tasks before beginning an upgrade. Certain versions require special data handling. Speak with your SAP Business One consultant for more details. Not every Portal upgrade requires an upgrade of InterConnect Server Tools. Otherwise, there are no special instructions for upgrading this component. Review the upgrade chart above to determine if this is required for your upgrade. Every upgrade from one Service Pack to another requires an upgrade of InterConnect Manager Add-On. Before upgrading InterConnect Manager Add-On, backup any custom configuration settings, such as payment settings, welcome messages, menus, etc. To do this, open each config screen found under InterConnect Manager AddOn > Administration, and take a screenshot or copy/paste any field that is too long for a screenshot. Save this information in case updates to the add-on overwrite this. Specifically, upgrading from version 5 or 6 to version 7+ will delete Payment Gateway configuration and Order Pad configuration. Pay extra attention to payment gateway settings before performing an upgrade from versions 5 or 6. Menus have changed as of Service Pack 2 for B1 9.2 (version 92.2). Ensure all menus are migrated properly after an upgrade. Back up InterConnect Manager Add-On settings. Be sure to perform backups of any Customer Portal settings found in InterConnect Manager Add-On for SAP Business One. Specifically, Payment Options must be backed up when upgrading from version 7 or lower. Payment settings were changed in later versions. This requires a complete re-configuration of this setting. Back up custom web files. Any file found outside of the Customer Portal folder /customs/ may be deleted during a website upgrade. If customizations are found outside of that folder, copy customized files into another location to back them up. Merge customizations over a new installation. When upgrading web files, recommended best practice is to install the standard Customer Portal web files in a new location, then merge in custom/updated files from the old version. This avoids certain odd behavior due to caching and deprecated files. These types of display issues may be resolved manually if they occur on a system that was upgraded instead of merged. Identify multi-language upgrade tasks. Multi-language support has changed. If you are upgrading a version of Customer Portal that already includes multi-language support, please contact your SAP Business One consultant to ensure this is migrated to the new multi-language format. Back up InterConnect Manager Add-On settings. Be sure to perform backups of any Employee Portal settings found in InterConnect Manager Add-On for SAP Business One. Note that as of version 92.5, settings have changed considerably. Back up custom web files. Any file found outside of the Employee Portal /customs/ folder may be deleted during a website upgrade. If customizations are found outside of that folder, copy customized files into another location to back them up. Merge customizations over a new installation. When upgrading web files, recommended best practice is to install the standard Employee Portal web files in a new location, then merge in custom/updated files from the old version. This avoids certain odd behavior due to caching and deprecated files. These types of display issues may be resolved manually if they occur on a system that was upgraded instead of merged. Also ensure to copy any signature image files found in the website’s /signatures/ folder. This will ensure web users can continue to view older signature capture. An upgrade from a version prior to SP2 for B1 9.1 will require special attention related to Sales User. These steps must be completed whether or not Sales User was active prior to the upgrade. The following steps must be completed whenever an upgrade is applied and Sales User will be used, whether or not Sales User was used in the old version. Tip: Follow the general Employee Portal upgrade steps first. Sales User is an additional license, the actual upgrade is applied to the core Employee Portal. If upgrade of Employee Portal was completed in-place instead of as a side-by-side install with merge, ensure that you rename (or delete) the old Sales User folder salesuser to ensure these files do not conflict with new sales user. If customizations were applied to the old sales user, these will need to be migrated to the new Sales User format. Update the “My Opportunities” menu entry to point to /salesuser/board instead of the old opportunities screen. See screenshot below. Update the My Opportunities link to point to the new opportunity board, as shown. Update any custom report links and golden arrow drill-downs which point to old Sales User links. For example, customer detail drill-downs on a customized customer report will need to point to the new sales user customer details page. After an upgrade to the latest version, new Sales User features may be available out-of-the-box that once required customization. Assess the new Sales User features to see if further customization is required. In this case, you may create new customizations. Note that the old sales user and its customizations may be activated, however this will not be supported via the normal product support. Speak with your InterConnect implementation consultant if this is your preferred option. Warning: Vendor Portal does not require updates for version 92.5. If this is the only product installed, do not upgrade InterConnect Manager Add-On. If multiple Portals are installed which require upgrade, contact your InterConnect implementation consultant. Back up InterConnect Manager Add-On Settings. Prior to upgrade, perform backups of any Vendor Portal settings found in InterConnect Manager Add-On for SAP Business One. Back up custom web files. Any file found outside of the Vendor Portal /customs/ folder may be deleted during a website upgrade. If customizations are found outside of that folder, copy customized files into another location to back them up. 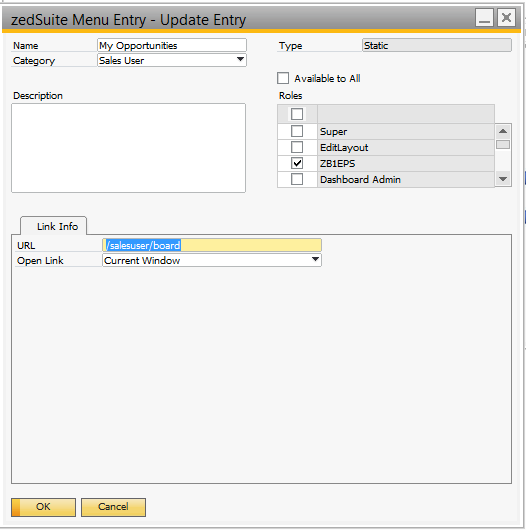 Merge customizations over a new installation. When upgrading web files, recommended best practice is to install the standard Vendor Portal web files in a new location, then merge in custom/updated files from the old version. This avoids certain odd behavior due to caching and deprecated files. These types of display issues may be resolved manually if they occur on a system that was upgraded instead of merged. Interconnect projects are fully customized and require extra attention to avoid loss of functionality and settings during an upgrade. Speak with your InterConnect implementation consultant before performing an upgrade. Remove Workflow message hooks from the SBO_SP_TransactionNotification stored procedure. Prior to upgrade, all Workflow message hooks must be removed from the SBO_SP_TransactionNotification stored procedure and inserted in the SBO_SP_PostTransactionNotice stored procedure. Insert the Workflow message hooks in the SBO_SP_PostTransactionNotice stored procedure. The Workflow message hooks removed from SBO_SP_TransactionNotification must be inserted into SBO_SP_PostTransactionNotice. Relocating Workflow message hooks ensures that Workflow messages will be created after validation is completed.